Cover Artwork: Cover painting: ‘Pohutukawa Abstract’, acrylic on canvas, by Harold Coop, Auckland, New Zealand. Reproduced with the kind permission of the artist. Taking its title from the myth surrounding St. Bridgid’s flame in Kildare, Guarding the Flame takes us on a journey through familiar and unfamiliar lands, from Ireland, to Europe and Asia, and finally the country where Majella Cullinane currently resides, New Zealand. Her poems explore nature and dreams, real and imagined people, and the power of history and myth. The concept of home and the feeling of otherness, of belonging and unbelonging are punctuated with intimate observations on love, childhood and motherhood; the small moments that make us what we are, and the possibility of reinventing oneself. Majella Cullinane was born and raised in Ireland. She became a New Zealand resident in 2008, and lives on the Kapiti coast. She has previously received a Sean Dunne Young Writer’s Award for Poetry, the Hennessy XO/Sunday Tribune Literary Award for Emerging Poetry and also an Irish Arts Council Award to study for an MLitt. in Creative Writing at St. Andrew’s University Scotland. She has been a Writer in Residence in Ireland and Scotland. on a winter’s morning, at a train station. at the end of glass stems in a shop display. is like a butterfly wing. of a past generation still warm in our hands. Let me make this quite clear right from the outset: Majella Cullinane can write; she is a damned good poet. This is a quite quiet, understated, mellow collection; the whole tone reflects one of the thematic obsessions here: Autumn. Indeed there is a continual reflection on falling leaves, and the soft autumnal tones of this season – as witness titles such as ‘Leaves’, ‘Autumn Is Where You Find It’, ‘Autumn’s End’. There is no bombast here, no overly academic accent on arcane and archaic allusions, nor is there deliberate obscurity or the pilfering of other languages so as to make the verse ‘politically correct’. This is not an extended exercise in pretentiousness. in envy and does not speak. There is also here, even more predominant than the reflections on falling leaves and the daubing of concomitant natural hues flecked with appearances of New Zealand native birds, a steady series of ruminations on what it is like to be a recent immigrant to Aotearoa-New Zealand: for Cullinane is an Irishwoman now faaaaaar from home. Indeed, this book is published by Salmon Poetry, County Clare. to the call of birds flying northward. no rain on a corrugated iron roof, tap, tapping into her heart. bays and inlets from another hemisphere impressed there. A stranger in a strange land indeed. Robert Heinlein would be proud. will later arouse the blood to warmth and glow. Review: Guarding the Flame reviewed by Siobhan Harvey for Poetry NZ, Issue 44.
on a winter's morning, at a train station. Time and again, as in verse such as the titular poem, 'The Kiss' and 'Autumn's End' the seemingly simple is transformed into something powerful. Thematically this combination of the unadorned and resonant finds fullest voice where the poems traverse issues of expatriation. 'Ruru', 'Emigrants', 'Memory of Birds', 'Paekakariki', 'Desert Road': here are poems which weave together a cogent philosophical exploration of migrant life. A first New Zealand collection is surely the next logical step for this promising poet. I nestle in the cup of my hands. It is this that frightens you. buoyed in a gully of dreams. "The Force of Things" first appeared in Takake 71, ed. Siobhan Harvey, and was published in Majella Cullinane's collection Guarding the Flame (Salmon Publishing 2011). It is reproduced here by permission of the author. Majella Cullinane is an Irish poet who has recently emigrated to New Zealand. 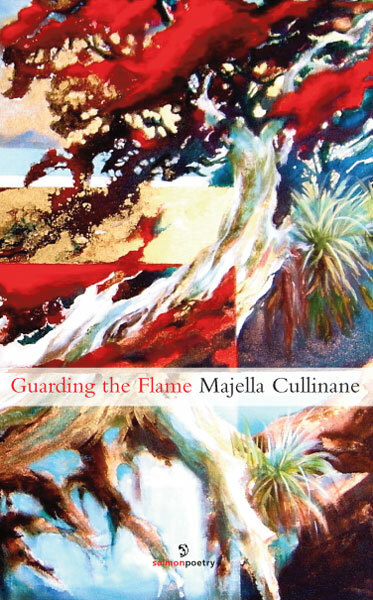 I heard her read her poetry at September's New Zealand Poetry Society meeting in Wellington, enjoyed hearing her poems very much, bought her debut collection Guarding the Flame, and am very pleased I did. The poems in Guarding the Flame cover the poet's old life in Ireland, her new life in New Zealand, and the transition between the two. It's well worth reading if you like Irish poetry or New Zealand poetry - or if you just like poetry. Tim Jones is the editor of this week's Tuesday Poem. Tim is a poet, author and editor who lives in Wellington, New Zealand, and won the NZSA Janet Frame Memorial Award for Literature in 2010. He is about to embark on a book tour with Keith Westwater, to launch Tim's new collection Men Briefly Explained and Keith's debut collection Tongues of Ash. This week, one of Tim's poems from Men Briefly Explained is Mary McCallum's Tuesday Poem, and next week Tuesday Poet Helen Lowe will post one on her blog.